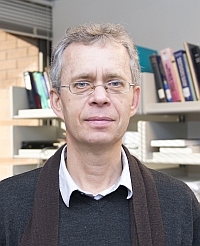 Matyushov's research interests are in theoretical and computational condensed matter physics, physical chemistry, and biophysics. He received his undergraduate degree from the Moscow Institute of Physics and Technology and his Ph.D. in theoretical physics from Kiev State University (Ukraine) and the Ukrainian Academy of Science. He worked in Vienna Technical University (Austria) as an invited professor and as postdoctoral researcher at Colorado State University and the University of Utah. He joined the faculty of Arizona State University in 2000. His research in Arizona included spectroscopy, solvation, phase and glass transitions, complex fluids, electron transfer, dielectric spectroscopy, and bioenergetics (mechanisms of photosynthesis and respiration). Current interests include protein dynamics, electrostatics of the protein-water interface, and mechanisms of enzyme catalysis. Statistical mechanics of complex systems, spectroscopy, solvation, phase and glass transitions, electron transfer, dielectric spectroscopy, and bioenergetics. Video lecture on "Feeding Biology with Electrons"